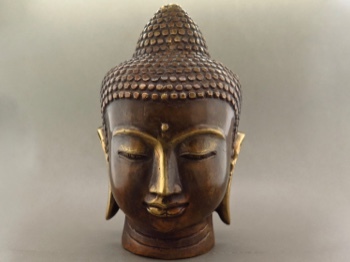 Cast bronze Shakyamuni Buddha head, with chiseled features, silky smooth skin and a mellow golden patina. 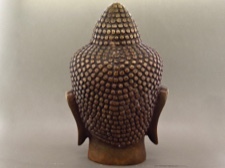 Created in Bali, this statue stands 6.5 inches high and has a diameter of 4 inches. Buddhism originates in the teachings of Shakyamuni, who came from the tribe of Shakya, 2500 years ago in what is now Nepal. Born a prince, he was deeply troubled by the problem of human suffering. He embarked on a spiritual quest to understand how this suffering could be overcome. Through meditation, he attained awakening, or enlightenment, of the true nature of life. 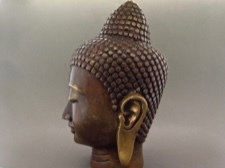 Because of this enlightenment he came to be called Buddha, or Awakened One. Shakyamuni traveled widely sharing his wisdom and promoting peace. His intention was to enable people to attain the same enlightenment he had attained. Following his death, his disciples recorded his teachings in the form of sutras and spread his message thoughout Asia, always emphasizing peace and compassion. This information was gathered from Soka Gakkai International, Buddhism in Action for Peace.